“Steampunkinetics” brings the spirit of the sub-culture to an art gallery after over 30 years of influencing pop culture, aesthetics and our lifestyle. Machines make up the bulk of the group exhibition, although these objects privilege fantasy over futility. Tick-tocking, whirring and even time-travelling, the collection looks as if it could be found in the depths of a mad scientist’s lab. 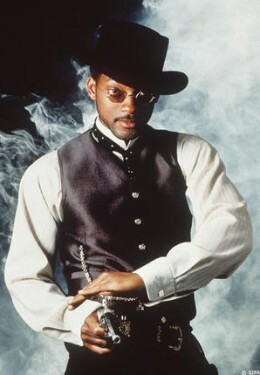 Steampunk is based on the hybridization of disparate parts, whether they be eras, ideologies or effects. The movement harnesses the steam-based industry of Victorian times or the Wild Wild West, juxtaposing it with the modern pace of the information age, or perhaps even a futuristic post-apocalyptic fantasy world. (Steampunk author Gail Carriger explained it as “the love child of Hot Topic and a BBC costume drama.” Yet instead of neatly weaving these eras together, Steampunk jams them up against each other like old machine parts until the unlikely gizmos run again. Privileging both recycling and survival as well as futility and frivolity, the movement is a buzzing cluster of contradictions, as are the machines that spring of it. 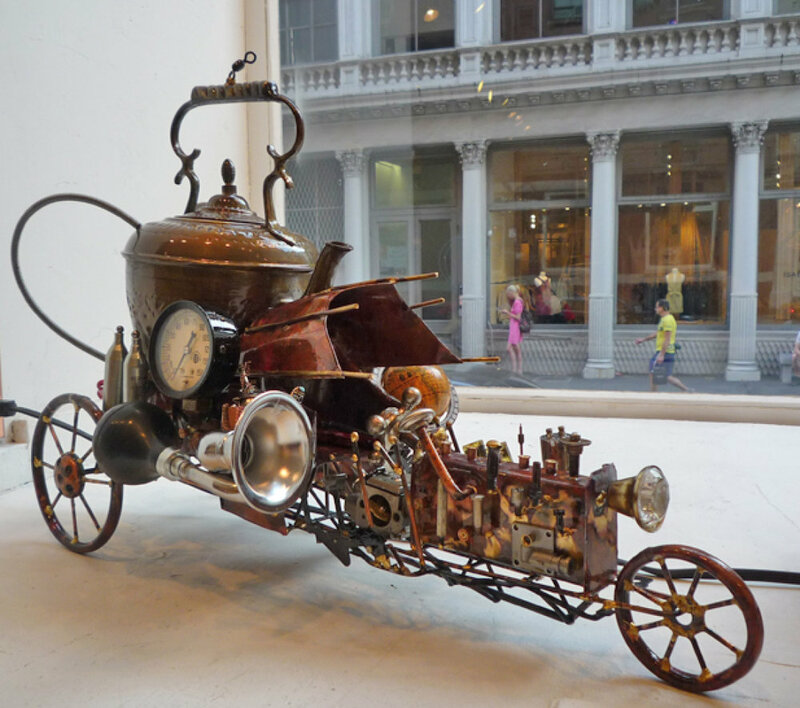 “Steampunkinetics” is centered around “Steampunk Wedding Time Capsule,” a work by Bruce Rosenbaum and Gary Sullivan. The ornate apparatus reveals the inner workings of a clock, combining an old-fashioned aesthetic with the internet’s inclination toward image-overload. The owners set the capsule to open at a certain date and time of their choosing, adding a memento to the piece every year until the grand reveal. In turn, Eric Freitas’ “No.7” presents a clock seemingly singed down to a skeletal wing, resembling a wounded insect more than a timepiece. Its fragile beauty is deceptive, however, seeing as the piece still weights 100 lbs. 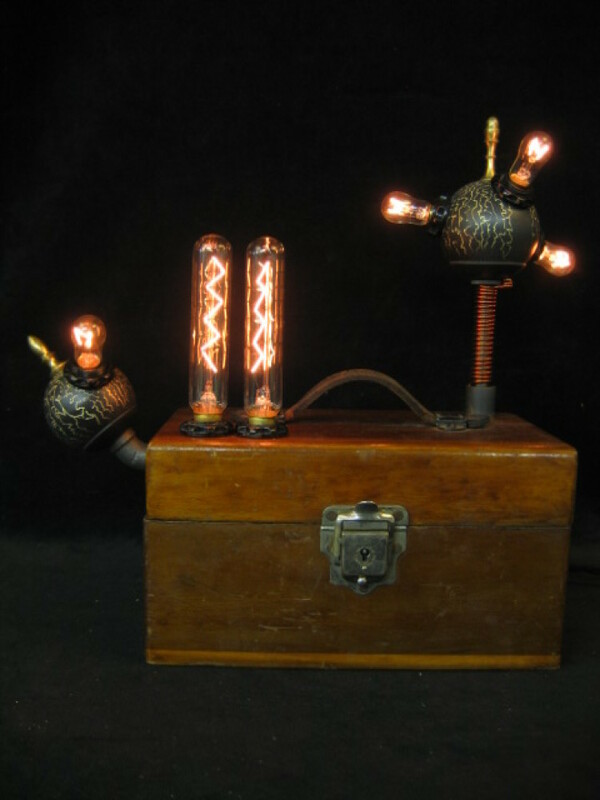 Another piece, titled, “Mesmor Ion Generator” by Wayne Strattman, emits a ghostly green light while electric wiggles dance on top. 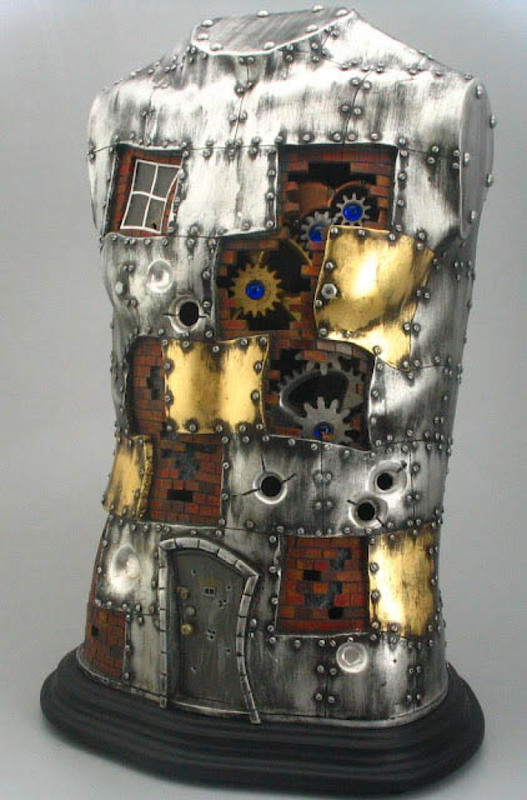 And “No Way Out” by Dake Mathis features a patchwork metal bust that simultaneously resembles a shoddy cottage. The show serves as an interesting point of contrast with the New Museum’s “Ghosts in the Machine,” which also examines the uncanny relationship between man and machine. Yet while Ghosts seems to offer an antagonistic and haunting relationship, this one provides more hope. With its focus on self-sufficiency and creativity, Steampunk has a lot to offer aside from escape.